I was inspired to write this note about frogs and field guides after seeing the image of a frog posted online by my good friend Jonathan Walz, Assistant Professor of Anthropology at Rollins College in Florida. This striking photo was taken in 2002 in Amani Nature Reserve in the East Usambara Mountains of Tanzania, and gives a nice sense of the forested environment that Amani is famous for. 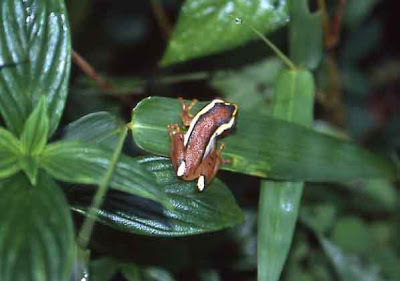 Its subject was identified for Jonathan by Kim Howell (another friend, and Professor of Zoology in the University of Dar es Salaam) as an example of Mitchell's reed frog, Hyperolius mitchelli, a species that has also been recorded in Malawi and Mozambique. It might well occur elsewhere in Tanzania, but very little collection or sound recording of frogs has taken place in the country, and our knowledge of the distribution of many species like this is correspondingly sketchy. Despite having lived in environments with a superabundance of cacophanous anurans (most notably amidst the seasonally-flooded wetlands of Usangu and the verdant rice valleys of Pemba island), I don't own a single photo of a toad or frog, and regret now that for many years I didn't have a camera capable of taking one. My notebooks, though, do feature the occasional frog that attracted my attention, like the Banded rubber frog (now Phrynomantis bifasciatus, formerly Phrynomerus) that I stumbled upon one day in 1992 in our garden in Nyali, on the north coast of Mombasa. I identified this with the aid of the only guide that I had at the time, Norman Hedges' Reptiles and Amphibians of East Africa (1983), which includes fuzzy and poorly reproduced colour photographs of fewer than a tenth of the frogs known to occur in the region. Needless to say, the Banded rubber frog is quite distinctive, with two vermillion (or orange, or red) stripes along its black back, and that's why it had caught my eye in the first place. For the same reason it's well known in the pet trade. What I didn't know when I scooped it up was that this bright colour scheme signals the presence of skin toxins that can be fatal to predators and result in a raft of distressing symptoms when they enter the human bloodstream. You'll be glad to hear that we didn't exchange body fluids. I had less success in identifying other frogs. The 'one that got away' was a delicate yellow tree frog that I saw one evening in the foliage next to our outdoor table at the Jambo Inn in Kilimani in Zanzibar town. It was bright and glossy yellow all over its smooth and tiny body, and I noted it as a curiosity before continuing with the meal. This was in July 1996: much later I asked Kim Howell what it might have been and he merely shrugged. Perhaps this was the juvenile or colour morph of an otherwise well-known tree or reed frog, but I still haven't been able to identify it. Lack of a good field guide also scuppered my sundry efforts to make sense of indigenous knowledge about frogs. When living on Pemba in 1994-96 I recorded bits and pieces of information about the island's amphibians, and in 1997 drafted a short article about the local classification of frogs and toads. But I gave up on this when I realised that my preliminary attempt to map Pemban names onto scientific taxonomy was deeply flawed, and based on little more than unsubstantiated guesswork. I had Pakenham's (1983) checklist of the island's amphibians (which he knew was incomplete), but no illustrated field guide with which to compare local descriptions. Things began to look up at the turn of the millennium, when I was based in Iringa and became aware of the work of Alan Channing (Professor of Biodiversity and Conservation Biology in the University of the Western Cape) and colleagues. Indeed my sole (and admittedly feeble) claim to frog fame is to have been consulted over the specific name of the newly discovered Red sand frog, Tomopterna luganga, first collected by another of my friends, David Moyer, from Kigwembimbi, 14 km east of Iringa town (Channing et al. 2004). This is in the heart of Uhehe, and the name that I was asked to check, luganga, is one of the Hehe words for 'sand'. I bought a copy of Alan Channing's Amphibians of Central and Southern Africa (2001), and at last had a field guide that provided better guidance than Hedges' slim section on frogs. Channing and Howell's Amphibians of East Africa (2006) came out after I'd left East Africa, and I still haven't got my hands on it, though I do have the boiled-down version that was published in the same year in the Pocket Guide to the Reptiles and Amphibians of East Africa (Spawls et al. 2006). When he was working on the main guide, Kim Howell sent me a list of local names of frogs that he and his colleagues had collected, together with older records by the herpetologist Arthur Loveridge. While many dictionaries and vocabularies only give a single word for frogs, it is evident that finer discriminations are made in a number of East African languages. Ethnotaxonomies of frogs have been even less studied than the frogs themselves, and it is not impossible that complex systems of knowledge like those of the Kalam (Karam) of highland Papua New Guinea (Bulmer and Tyler 1968) are waiting to be described. At least we now have better guides to work with, together with an increasing number of images online, and if I ever identify that tiny yellow frog, or figure out those Pemban classifications, I'll write another frog blog. As should be clear, I couldn't have written this post without the friendship of Jonathan Walz, Kim Howell and David Moyer. I'm especially grateful to Jonathan, who generously provided a copy of his photograph of Mitchell's reed frog and gave me permission to edit and reproduce it. Bulmer, R. N. H. and M. J. Tyler 1968. Karam classification of frogs. Journal of the Polynesian Society 77 (4): 333-385. Channing, Alan 2001. Amphibians of Central and Southern Africa. Ithaca, NY: Cornell University. Channing, Alan and Kim M. Howell 2006. Amphibians of East Africa. Ithaca, NY: Cornell University Press. Channing, Alan, David C. Moyer and Abeda Dawood 2004. A new sand frog from central Tanzania (Anura: Ranidae: Tomopterna). African Journal of Herpetology 53 (1): 21-28. Hedges, Norman G. 1983. Reptiles and Amphibians of East Africa. Nairobi: Kenya Literature Bureau. Spawls, Stephen, Kim M. Howell and Robert C. Drewes 2006. Pocket Guide to the Reptiles and Amphibians of East Africa. London: A&C Black.